CompuPhase also develops custom software and electronics. You will find more about our services on the tab page "Projects". To configure the key of the USB Button, the first step is to connect it to a PC. For a standard (wired) USB Button, you connect the button itself to the PC. For a Wireless Button, you connect the interface (the Dongle) to the PC. If the “Key Configurator” utility is not yet installed, the second step is to download & install it. If it is already installed, you can simply launch it. Dowload the right version for your operating system. Note: On the Apple iMac, the Key Configurator utility must run with “root privileges”. You can either log in as root and launch the application, or start the utility from a terminal with “sudo”. On Linux, the package installs the required “udev” rules. This assumes that your Linux setup has udev installed and running; if not, you must run the Key Configurator utility as root. For the help function, the Apple and Linux versions need a “compiled help” viewer (CHM-viewer). For the Apple, iChm is recommended. On Linux, kchmviewer and xchm are supported. If multiple buttons are connected at the same time, the button to configure can be selected from the drop-down list for the “Model”. The drop-down list shows the model name and the last three digits of the serial number of each connected button. Note that the last three digits of the serial number are also printed on the USB Button itself (above the USB connector). 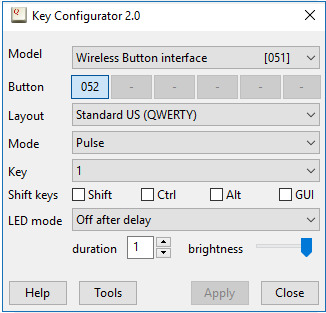 When the Dongle is connected, the Key Configuration utility enables the switch numbers (radio buttons) for all Wireless Buttons that the Dongle has detected. To have the Dongle detect a Button, press the Button once. This action will cause the Key Configuration utility to re-scan for Wireless Buttons in range. If a Wireless Button has not been connected to a Dongle yet, the Key Configuration utility will show the Pin-Code dialog. The pin-code for a Wireless Button is printed on the bottom side. 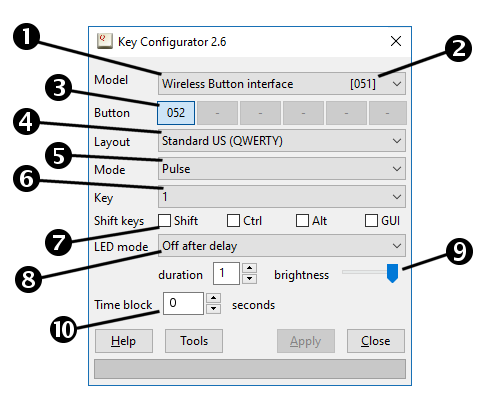 On start-up (or after connecting a USB Button or Dongle), the Key Configuration utility will show the model of the USB Button and its current configuration. The type of the button or dongle that is currently connected. This is a drop-down list; if you have multiple USB buttons connected, you can select which one to configure by selecting it from the drop-down list. The last three digits of the serial number of the button are shown at the right of the model. In case a Wireless Dongle is connected, this number is the serial number of the dongle. This serial number makes it easier to identify which button you are configuring. This row is only present for the Wireless Dongle. The Dongle supports up to six wireless buttons. You can select the one to configure by clicking on its respective button. The “keyboard layout” for the button should match the keyboard layout that is defined on the PC or workstation that the button is connected to. See the section Keyboard Layouts for more information. Auto-repeat On a switch press, a “key down” event is sent to the workstation, and on a switch release, a “key up” event is sent. When the switch is kept pressed, the “key down” event starts to repeat (just like a keyboard key repeats when it is held down). Pulse A switch press causes a “key down” event to be sent to the workstation, and a “key up” event is immediately sent after it (even if the switch is held down). The “key down” thus does not auto-repeat. Reliable Only for wireless buttons: this is “pulse” mode, but where the button repeats the transmission of a switch press if it does not receive a reply from the dongle. Macro A sequence of key codes is transmitted to the workstation. See the section “Macro syntax” for details. Toggle key In “toggle key”, two key codes are defined for the switch. At every switch press, these key codes are sent alternatingly: on the first switch press “key #1” is sent, on the second press “key #2” is sent, on the third press “key #1” is sent again, and so forth. A “toggle key” does not auto-repeat if the switch is kept pressed. From the drop-down list, you can select a key, which may be a letter, a digit, or a special key. Note that the USB Button transmits key codes as standardized for US qwerty keyboards by the USB standard. The USB Button does not know about key remappings for different languages as performed by the operating system. At the tail of the list, there are additional “input” commands or functions, that are not necessarily keyboard-related. For example, mouse button clicks can also be emulated. In “toggle key” mode, there are two “Key” fields, called “Key #1” and “Key #2”. In this edit field, you can enter the sequence of characters to transmit on a button press. The sequence does not auto-repeat if the switch is held down. See the section “Macro syntax” for details. Note that mouse button clicks (or other non-keyboard inputs) cannot be specified in a macro. By putting a checkmark in any of these options, you specify that the transmitted key is sent with these key shift options. For example, when F4 is selected as the key and the Alt option is checked, the USB Button transmits Alt + F4 on a press. The GUI key is also known as the “Windows” key. For example, GUI + R opens the Run dialog box. These “shift modifier” keys are ignored for the non-keyboard functions. For example, when configuring the button to a mouse click or to a “play/pause” toggle, the Shift/Control/Alt/GUI modifiers are ignored. The illumination can be controlled by user software, but you can also define default actions. See the Illumination configuration section. For buttons that support variable brightness, the brightness can be adjusted with this scroll bar. See the Illumination configuration section for more information. You must click on the “Apply” button to write the new key (and the modifier flags) to the USB Dome Button. After clicking Apply, you can close the utility and/or unplug the USB Dome Button. A macro is a sequence of key codes that are transmitted to the host device (as if someone typed in that sequence very quickly). A macro can hold up to 60 key codes on a single-button device (or 20 key codes per switch on the 6-button interface). Each key code may have a shift modifier prefixed. For example, to transmit Ctrl S, type “^S”. For the Shift key, most keys are automatically handled. For example, when you type “!”, it will implicitly be converted to “+1”, because on US qwerty keyboards the “!” is on the “Shift 1” key combination. However, to send any of the keys reserved for the shift modifiers, you need to translate these explicitly: so “+=” to transmit the “+” key and “+5” to transmit the “%” key. A USB keyboard transmits universal “key codes” to the workstation that it is connected to. To translate of these key codes to characters, the operating system uses the keyboard layout as a map. For example, USB key code 20 is a “Q” on a qwerty keyboard, but an “A” on an azerty keyboard. The USB keyboard also transmits its layout to the operating system, but Microsoft Windows ignores that field. Instead, Microsoft Windows allows users to select the keyboard layout to use, irrespective of the layout of the physical keyboard. For the USB button, the result is that the button should be configured for the same keyboard layout as that the target workstation uses. Otherwise, you might get the same effect as when you are using a qwerty keyboard on a workstation that is configured as using azerty. Several button models have internal illumination of the button actuator (the dome). The illumination can be controlled via application software, but the button can also switch the illumination on and off based on the mode and the parameters that you can configure. The illumination mode defines the action taken after a button press. It can be one of the following. The button does not turn the illumination on or off. This is the appropriate mode when the illumination indicator is controlled by other software (e.g. the “Button Lights” utility). The illumination is continuously on. The button is illuminated while it is kept pressed down, and goes off as soon as the button is released. The illumination toggles between on and off at each press. At the first press, the illumination toggles on; at the second press, it toggles off. Etcetera. The button is illuminated at a button press, and goes off after the specified number of seconds have elapsed. The button starts to blink after a button press, and keeps blinking for the specified number of seconds (after which it goes off). The “delay” option specifies the delay in seconds for the actions that turn off automatically after a period. Some models of the illuminated dome buttons feature a configurable brightness. For these models, the brightness can be adjusted by moving a slider left or right. Note that the slider is only enabled for the button models that support brightness adjustment. Before first use, a Wireless Button must be connected to a Wireless Dongle. A new button broadcasts its presence to any dongle in reach (it does so after every press on the button). When the Key Configuration utility receives a notification of a new button, it pops up the dialog that requests for its pin-code. If this newly detected button belongs to you, you can enter the pin-code and confirm the dialog. From that point on, the button is bound to the dongle. Other dongles will not see the button. The pin-code for a Wireless Button is printed on the bottom of the button. Once a Wireless Button is configured to a Dongle, other Dongles to no longer see it and the Button does not respond to any commands of a different Dongle. If you wish to reassign the Button to a different Dongle, you need to use the “Tools” button in the Key Configuration utility, and then activate “Promiscuous mode”. The next step is to press the Button. The Key Configuration utility will now pop up the pin-code dialog, where you can enter the pin-code for the Button. If you confirm this (and if the pin-code is correct), the Button is reassigned to the new Dongle. In promiscuous mode, the Dongle detects any Wireless Button, so including Buttons assigned to another Dongle. Promiscuous mode is limited, though, to detecting these Buttons. Without entering the pin-code, you cannot use or configure the button. Up to six Wireless Buttons can be assigned to a Dongle. If all six slots of a Dongle are used, no new button can be connected to it. If you need to start afresh, to use the Dongle with a different set of Wireless Buttons, you can select to perform a full reset of the Dongle. This action will return the Dongle to its initial state. If you wish to reassign buttons to that same Dongle again, you may need to set the Dongle to promiscuous mode.